First thing I want to say is I am TRULY sorry for being very absent lately. My life has taken quite the crazy turn, mostly at work where I find the most time to blog. I no longer have that time, which is a good thing and a bad thing. I have absorbed another person’s job and am swamped, but the trade-off is that they days fly by, even if I am stressed the whole day. Monday (yesterday) was the first day off my fast. I am truly proud of myself for sticking with this for 40 days, there were a few days I didn’t think I could or wanted to. My cravings sometimes were too much and there were days I wanted to throw in the towel. I haven’t been much of a finisher, so this was a good thing to prove to myself that I could (with God’s help of course) follow through with something I started. I am happy to say I have lost 23lbs! All my clothes fit amazingly, in fact I have found things that I still had tags on in my closet. I bought some “birthday” clothes for myself last year, my birthday is in June so almost exactly a year ago, I thought I was a certain size bought that and went home without trying them on. I remember going home trying on the pants that didn’t fit, then the top, throwing them all back in the bag and on to the top shelf of my closet. I was so mad. Now I get the joy of trying them on to have them be baggy. What a joy! I have seen others start their juicing journey because of my energy and excitement for it. I have been told by people I know, as well as complete strangers at the grocery store that my skin glows, and I see that in myself too. I’ve had good and bad days. Over all, this journey has been really amazing and I am happy that I started on it, and even more happy I finished and can feel the results. Yesterday Hubby got the good news that he got a job, that and it being the official day I could eat anything I wanted, we went out to celebrate. However, the joys that we had yesterday were almost robbed from us with some car problems I had on the way home. Satan didn’t win, he wasn’t allowed to rob us that joy. We went out to a local restaurant, they serve the best burgers, and I have wanted a cheese burger for 40 days! It’s funny, looking at the menu it was almost overwhelming. I hadn’t had so many choices in food in a long time it seemed, there were almost too many choices. 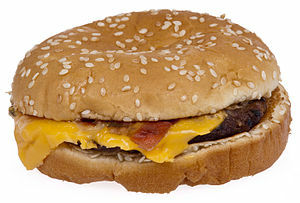 We settled on a bacon cheeseburger and split it, when it came out it looked great, smelled great. The first bite? You know, it was just ok. I know the hamburger was more than just ok, but my taste buds have actually changed. We finished our meal and went home, soon to discover that burger sat like a brick in our stomachs. Hubby even said we should have just went and spent that money on produce to juice, in a strange way I felt the same way. It wasn’t the awesome meal I thought I was about to have. I feel good about it, honestly, it helps me to know that I don’t need certain things in my life food wise, that I thought I did. I can be content and full and satisfied with a much more simple diet. So what’s next? I see myself having meat every once in a while, maybe once a week, maybe not even that. I see a mostly vegan diet with yummy vegan cheeses and stir fry and homemade black bean burgers. I see soaked nuts on my counter every day, with homemade sourdough bread cooling on the rack. Basically a whole foods diet, I don’t need processed garbage, tons of cheese (if you know me this is a really shocking statement, I used to adore cheese), or meat. I have to admit, I’m changed. I never want to go back to feeling the way I used to, to looking the way I used to… I pray that Corri is gone forever. I promised photos… I have them, but they will have to be posted another day. I’ve been too busy to load them onto a disc to bring to work and I never have enough time in the evenings, that is my Hubby time. So the bottom line is, if you are considering a juice fast of any kind, I highly recommend it! God’s nutritious foods are amazing life givers. Praise God for his blessings!